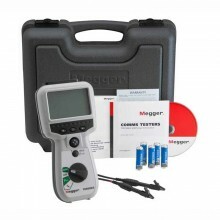 Includes: Hard carry case, Miniature clip test lead set and Megger TDR 500/3 User guide CD. 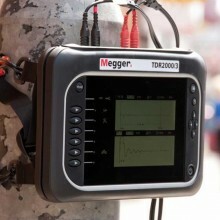 The Megger TDR500/3 is a hand held, compact Time Domain Reflectometer for locating faults on metallic cables. 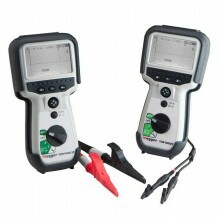 It has a minimum resolution of 0.1 m and a 5 km maximum range depending on velocity factor selected and cable type. 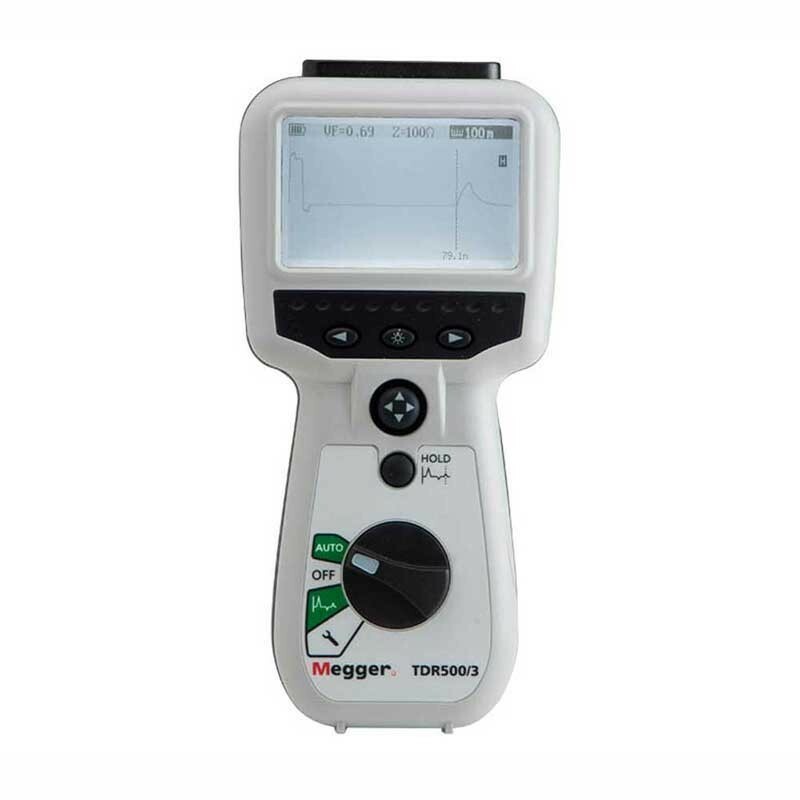 The Megger TDR500 menu allows the units of the distance and velocity factor to be changed. To enter the menu, switch the instrument on holding down the warble key. 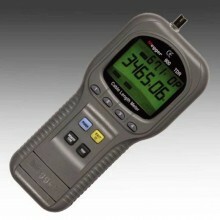 To change the displayed units, press one of the velocity factor keys. 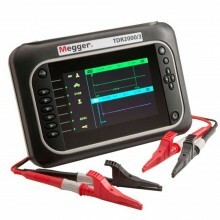 The options available are m and Ratio, m and m/us, ft and Ratio and ft and ft/us. 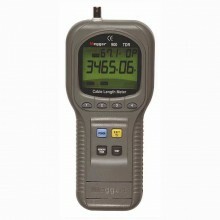 (30 ft, 75 ft, 300 ft, 750 ft, 3000 ft, 7500 ft, 15000 ft). 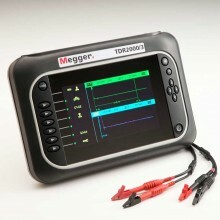 [Note- The measurement accuracy is for the indicated cursor position only and is conditional on the velocity factor being correct.]. 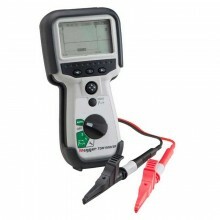 Input Protection This instrument complies with IEC61010-1 for connection to live systems up to 150 V CAT IV when used with the optional fused test lead set. Output Pulse 5V peak to peak into open circuit. 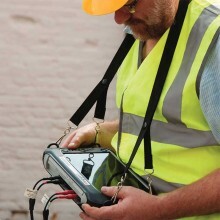 Pulse widths determined by range and cable. 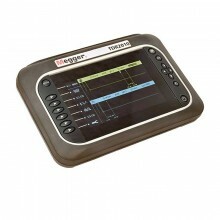 Gain Set for each range with three user-selectable steps (in manual operation mode). Velocity Factor Variable from 0.2 to 0.99 in steps of 0.01. Power Down Automatic after 5 mins with no keys pressed. 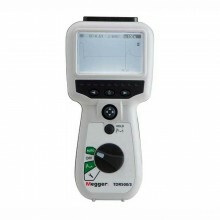 Backlight Stays on for 1 minute with no keys pressed. Batteries 5 x LR6 (AA) batteries, manganese alakli or nickel metal-hydride cells. Battery Life Up to 14 hours (typical). Dimensions 230 mm x 115 mm x 48 mm. 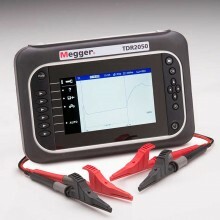 PDF Specifications of the Megger TDR500/3 Time Domain Reflectometer.